The Academy of Country Music has announced a $1 million endowment to ACM Lifting Lives, made on behalf of the artists who participated in the taping of ACM Presents: Brooks & Dunn – The Last Rodeo in Las Vegas in April. Ticket proceeds from the taping went to ACM Lifting Lives, which in turn quickly earmarked funding for those affected by the recent floods in Middle Tennessee. The gift successfully completes a three-year funding commitment and fundraising campaign the Academy initiated in 2008. Honorees Brooks & Dunn along with Jason Aldean, Kenny Chesney, Faith Hill, Jennifer Hudson, Lady Antebellum, Miranda Lambert, Reba McEntire, Tim McGraw, Brad Paisley, Rascal Flatts, Darius Rucker, George Strait, Sugarland, Taylor Swift, Carrie Underwood and Keith Urban all participated in the taping, with more than 10 million viewers tuning in to the special on CBS on May 23. Two major disbursements from the $1 million endowment have already taken place—with more planned in the coming weeks. On May 16, superstars Lady Antebellum and Paisley presented the first disbursement, a $250,000 check on behalf of ACM Lifting Lives to The Community Foundation of Middle Tennessee. The presentation was made live during the Great American Country (GAC) telethon, Music City Keep On Playin’ – A Benefit for Flood Relief. 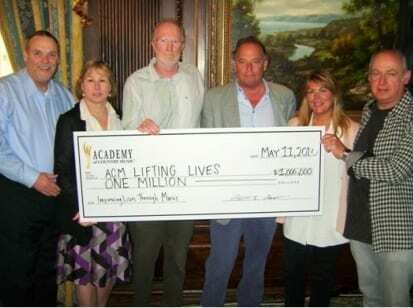 (L-R) ACM President Bill Mayne, ACM VP Sarah Trahern and ACM Chairman John Grady, present $1 million to ACM Lifting Lives VP Mark Hartley, ACM Lifting Lives President Gayle Holcomb and ACM Lifting Lives Chairman Gary Haber. Last week, reigning ACM Entertainer of the Year Underwood and ACM Lifting Lives announced the creation of the new ACM Lifting Lives Temporary Home Fund to support flood relief efforts. The Fund takes its name from Underwood’s co-penned hit song “Temporary Home,” in acknowledgement of the immediate needs surrounding those impacted by the floods. Seed money to start the Fund represents the second disbursement from the $1 million endowment, with ACM Lifting Lives and Underwood each providing a portion to get it off the ground. A text-to-donate campaign for the Temporary Home Fund officially launched May 20 and continues through August. Underwood taped a PSA call-to-action inserted into ACM Presents: Brooks & Dunn – The Last Rodeo when it aired on May 23, encouraging viewers to text ACM to 501501 to make a one-time $10 donation. These donations will benefit The Community Foundation of Middle Tennessee and are earmarked specifically for nonprofits serving those displaced from their homes due to floods. The ACM Lifting Lives Temporary Home will be administered in part by MusiCares and The Community Foundation of Middle Tennessee, to help ensure that people in need of temporary housing will have the support of nonprofits able to help. Donations can be made NOW by texting ACM to 501501 through August 2010. Text donations are confirmed by replying with YES, and can be made up to three times. Donations can also be made online at www.ACMliftinglives.org. For information on the funding application process, visit www.cfmt.org.